Mostly when we try to use many applications or services there are many times we fail to give our social presence in all the platforms. It is really very hard to manage it all. You will often face such troubles when you are updating Facebook status and managing your Facebook pages. At such situations you will gradually land up updating Facebook page with your social Facebook status and by the time you realise it you have got few likes and shares. It is very important to place all your status and updates where it is needed rather than mixing it all. Giving few updates in each of your account won’t make your social profiles dormant and keep it active among other users. This simply means that you need to swap each account to post an update each time. What if you get all your services at one place? Just think of managing of all your email accounts like a Gmail, Yahoomail or a Hotmail service. Yes, you got it correct. 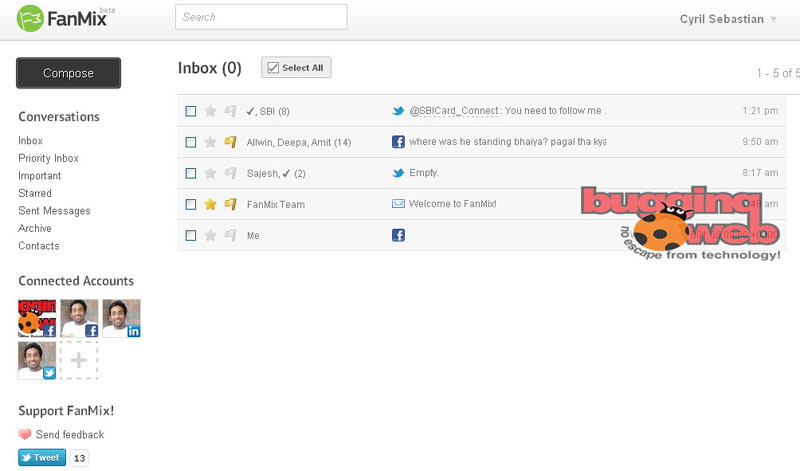 Fanmix is a solution for it, where you can actually get all your social updates in your Inbox and manage it with ease. Fanmix is brought by SocialEngine and backup up by Rackspace which is a hosting company. Link up your social accounts: This service allows you to link up various accounts like Twitter, Facebook, LinkedIn. Adding of profiles does not mean that you can only add one profile, you are also allowed to manage your clients accounts and Facebook pages too. Inbox view: You will notice the Inbox in your Fanmix profile which is similar to any other Email provider offering the mailbox. This gives a very good view of compiled updates and information from various accounts. There is priority inbox also like the once used in Gmail to show the importance of the mail. Shows recent updates: When you fell like monitor the recent updates done in the various accounts, you need to check the Sent messages. This is a very good tracking tool. 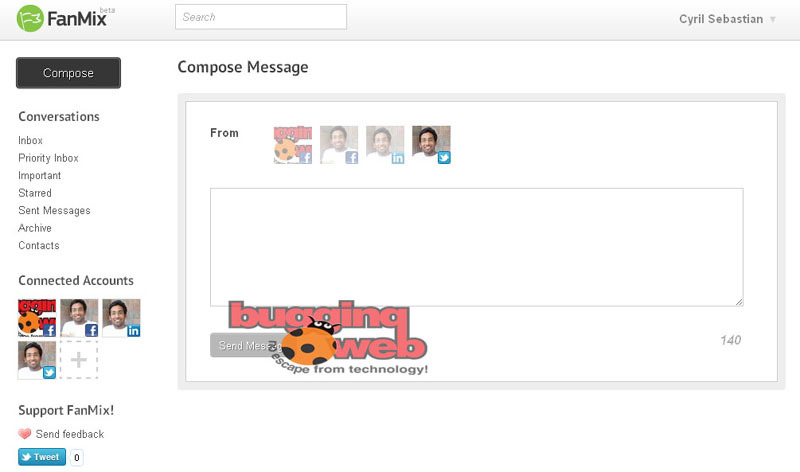 Search messages: Best part of the service is to search for messages which you have updated. This will be very helpful to get some important links or update information from archived updates. Compose update: It is as easy as composing a mail. In Fanmix it shows the added social networking sites from which you need to update the post. So, while composing an update you need to select the profile and update the status. Attractive interaction: The messages responded back also forms a good trail so that you could know the update you are responding to. This gives the proper formation of interaction done with others. What is more to come? Fanmix is also working on a commenting tools which will be added later in it. This blog commenting tool could make commenting on the blogs much easier. I started using Fanmix, and I like the service. But in my opinion it should add more service to be more familiar in the market. URL shorten service and updates scheduling features are the few examples which should be added to Fanmix. You could definitely see your expertise in the work you write. The arena hopes for even more passionate writers like you who are not afraid to mention how they believe. All the ready go after your heart. Thanks … revisit again for such articles! « How to use Facebook Page for your Business?